These bathroom vanity cabinets come with an overlay sink that fits perfectly on top of the cabinet. You can choose from a traditional single, a contemporary single or a contemporary double sink. The cabinet itself comes in oiled oak or painted in a selection of Fired Earth colours and in a choice of sizes, see prices below. See our Specifications Sheets: Contemporary Overlay Sink Cabinet and Traditional Overlay Sink Cabinet for full measurements and details. Prices listed above include the full cabinet in oiled oak or a painted finish with an overlay sink, interior shelf and door knobs. Please note that the 450mm cabinet has a single door, see picture in our Gallery. All other sizes have double doors. 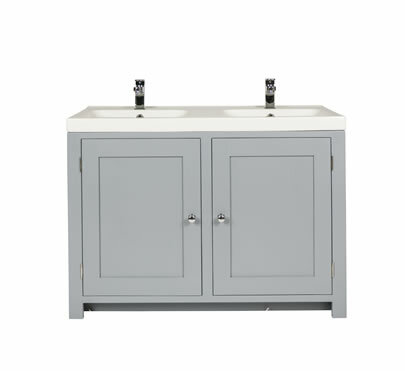 Our cabinets come ready for plumbing with a removable back panel for easy installation. Taps not included, see our Options page for our range of taps. Delivery. 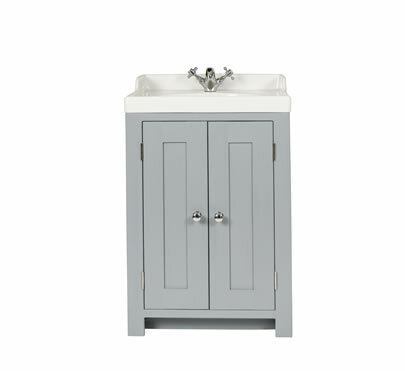 Our bathroom vanity cabinets are made to order and will be ready for collection within 4-6 weeks. Delivery can be arranged for a fee according to postcode. 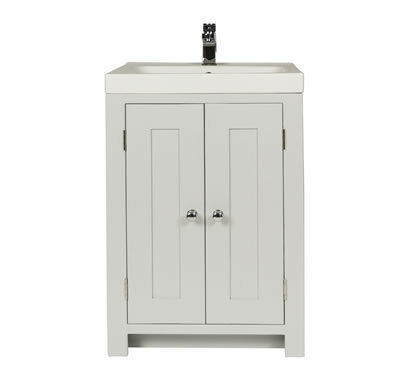 Call us now on 01932 355 332 to order your bathroom cabinet or to find out more about our products.